There is a reason why corduroy fabric is engrained in our brains as a timeless vintage staple and a flashback to the past; believe it or not, corduroy was first made in the 18th century in England. It was originally created to be used for working men's attire. It had many lives through the years until the 1960s when the first corduroy mini skirt appeared on the runway and shocked the fashion world forever. Today, corduroy still feels like a sweet nod to the 60s and 70s, when the fabric was living in its prime, adding rich color and texture to our closets. Not to mention the fact that the durable, made-to-last nature of corduroy makes it it a timeless fabric choice. However, not all corduroy is made sustainably. Below are our top 5 favorite sustainable corduroy picks in silhouettes we love! 1. Austin Pant by Reformation, $148 | We love these ultra 70s-inspired corduroy pants that come in 3 different colors. They are made from recycled cotton in a sustainable factory in China. 2. 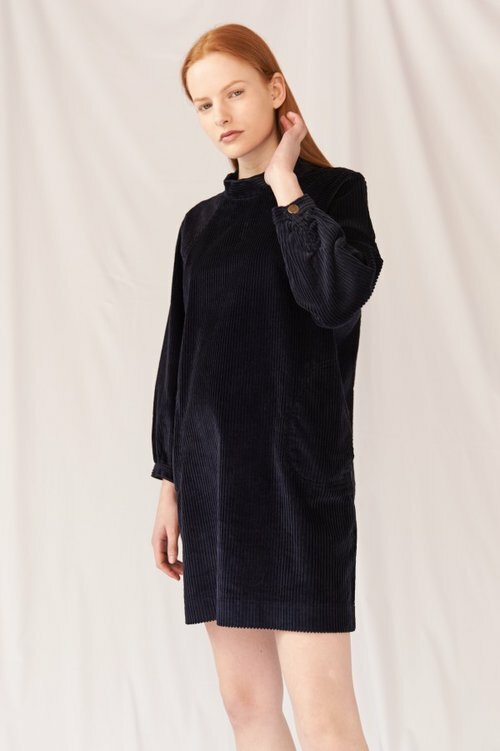 Indigo Cord Dress by M.i.h Jeans, £195.00 | The sophisticated silhouette of this cord dress offers a classic nod to the 60s. Additionally, this brand uses low impact manufacturing methods and committed sustainability practices. 3. Frankie Trousers by Lacausa, $154 | These cord trousers are a refreshing design and are the perfect color for spring. They are made from 100% cotton in downtown Los Angeles. 4. Dori Jacket by Paloma Wool, €149.00 | For the perfect pop of color, this dark red square cord jacket is made from 100% cotton and made with love in Barcelona. 5. The Corduroy Straight Leg Crop by Everlane, $78 | Another timeless 70s inspired color—this silhouette is an easy wardrobe staple that can go with a variety of different tops and colors throughout any season. Made from cotton in an ethical factory in China.